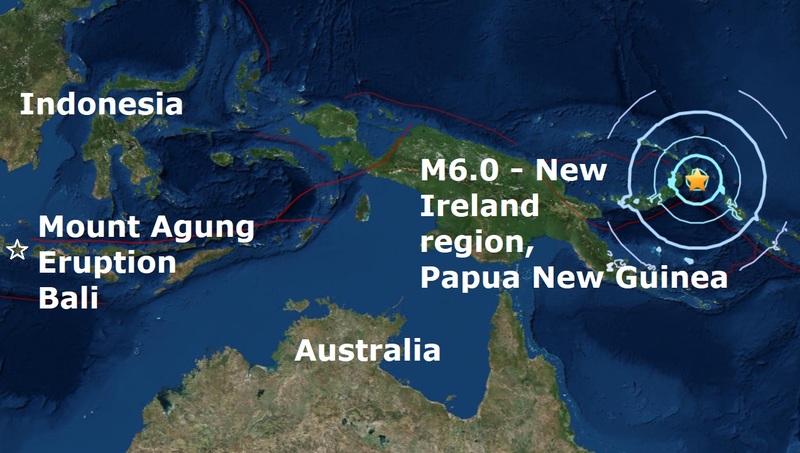 The South Pacific Ring Of Fire is living up to its name as a magnitude 6.0 strikes Papua New Guinea in the same part of the world as the Mount Agung eruption on the Indonesian island of Bali. Today's quake is the 16th major quake of November which is the busiest month this year by a country mile for quakes of mag 6 or higher. It is also the 101st major quake of 2017 which is well below par as we are well into the 11th month of the year, 2017 is almost certain to be the lowest year this century for major quakes. A mag 7.9 - 35km WNW of Panguna, Papua New Guinea in January is the second largest quake of the year after the mag 8.2 in Mexico in September.